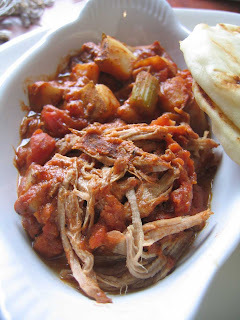 Crock pot cooking is a great, easy way to cook almost anything! But often times the flavors of crock pot cooking can tend to be the same leading to boredome. This recipes help cure that boredome. It's a bit of Indian/middle eastern spices meet American housewife cooking. Stop by Whole Foods and grab some naan bread to really round out the flavors of this dish. 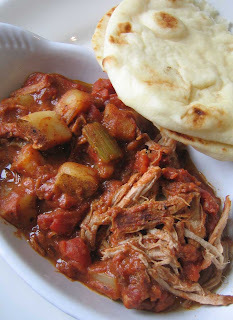 And if you're up for something really nutty- don't use a fork, use the naan bread to scoop up the pork and sauce! Crazy! If you're up for a little more spice, double the cayenne pepper! This is a fun recipe with loads of serious spice flavors- and a great break the the typical crock pot dish! And yet another reason to be fat and happy! Add all the ingredients to a crock pot. Simmer on low-medium low for 6-8 hours. Pull apart the pork with two forks. Turn up the heat to high- and simmer for about 20 minutes with the cover off, to thicken the sauce slightly. 1 potato, 1 carrot, 1/2 small yellow onion and 1 celery stick - all chopped to bite size pieces. Toss with olive oil, salt and pepper, lay on a baking sheet and roast in the oven (375 degrees) until potates are just fork tender. You can add the veggies to the crock pot with the pork for ease, do add another 1/2 to 1 cup of broth to compensate for the liquid the veggies will soak up. The potatoes will be a bit mushier if done in the crock pot - but still good! Another interesting way to serve this is with basmati rice rather than to potatoes-for an even more authentic Indian feel.